For over 50 years, Whittemore-Durgin Glass Co. has been designing, creating and repairing stained glass windows, panels and lampshades. Do you need a stained glass item repaired? 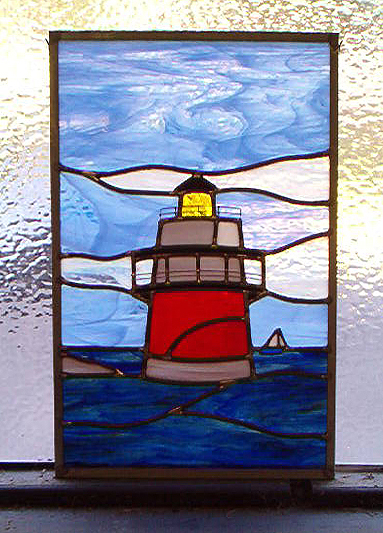 We have the experience and expertise to bring your stained glass piece back to life. You can trust your window, panel or lampshade to our expert studio. We can match the glass with one of the hundreds of glass styles in stock. Or, if we don't have an exact match in stock, we can special order just the right glass. We use the least invasive procedure possible to remove the broken glass or damaged metal, and replace it, always with the utmost in care. Would you like a window, sidelight or transom for your home? We have many designs from which you can choose, or you can provide us your own drawings or ideas. We are happy to work with you to come up with just the right design to compliment your home. 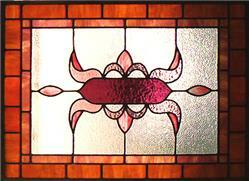 Stained glass windows and beveled glass panels are custom crafted to your specifications. All windows are handcrafted in the traditional "lead came" method for strength, flexibility and durability, using the same techniques employed by master glass craftsmen for hundreds of years. We can also create panels using the copper foil method, or we can sandblast clear or colored glass. We are experienced in many methods of working with glass. Just ask. Many people are discovering the beauty of textured glass for kitchen cabinet doors. Choose from over 50 different textures of clear architectural glass, or from hundreds of selections of colored glass for a truly unique look. We will custom cut and safely and securely install glass in your kitchen cabinet doors. 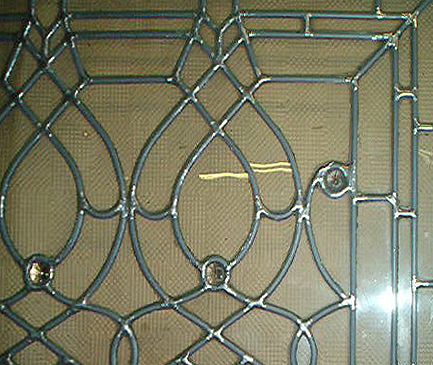 Or, let us create leaded glass panels for your kitchen cabinet doors, for a handsome, distinctive appearance. Just bring your item or idea in, call us, or send us an e-mail, and let's talk. We'll be happy to look things over, maybe ask a few questions, and provide you with a time and price estimate.